Before you read the ISOBrite Super Bright 200m Dive Watch Review, you should know that ArmourLite is a popular manufacturer brand among wristwatch enthusiasts. They have been one of the primary manufacturers to license the use of Gorilla glass – something that is used on your high-end electronic devices like smartphone, laptop, etc. The inclusion of such toughened glass makes their products everlasting, practically shatterproof and extremely scratch-resistant. The ISOBrite T100 is made of polycarbonates where the T stands for tritium and 100 is the amount of tritium used. The higher the number, the brighter your watch is going to be. ISOBrite’s illuminating power is almost four times the regular tritium watches. This watch is a valid option for divers because of its capacity to stay legible even 200 meters under the sea. But that’s not the unique feature. Keep reading our ISOBrite T100 Super Bright 200m Dive Watch Review to know more about this product. If you love to sport big tactical watches, this one is definitely for you. The 44m diameter attributes to its chunky and serious look when compared to regular watches. However, the ultra-light case and silicon strap make it a comfortable wear. The thickness of t100 watch is 12mm which is just like any other watches. Thus, the large yet slender dial with a chick looking strap that looks not only good but also fits comfortable over a diving suit is designed to impress you the first time you see it. The ISOBrite T100 uses Swiss Ronda 715Li Quartz which is designated to give you a continuous service for 10 years. This saves time, energy and money by not worrying about its service or by changing the battery every other year. Since you don’t need to change the batter before ten years, there is less chance of the push-pull, water-resistant crown to get damaged. The hours, seconds and minutes and date come with the safety feature of a one-way rotating bezel that increases its reliability as a diver’s watch. The diameter and unidirectional bezel definitely add to the look and readability of the watch, but our ISOBrite T100 Super Bright 200m Dive Watch Review has found out that it is the two tritium pipes the makes it very secure and prevents the bezel from falling off. The polycarbonate framework and the sapphire crystal anti-reflective and scratch resistance build put the watch way ahead of its peers. The Gorilla glass is also securely placed, and the back of the case is attached firmly with four screws. The higher volume of tritium gas makes it easier to read the watch underwater and at places with no or little light. The T-100 Tritium illumination is what makes this watch different from the rest. The tiny date window is also readable and functional, as well as the addition of military time in smaller white numbers. The watch comes with both a silicon rubber and a NATO strap. Both the straps are comfortable. The silicon strap is soft and will not make your wrist feel itchy when your hand is in contact with water or sweat. Surprisingly both the straps give out a classy look without making them look cheap and artificial. The Gorilla glass dial is virtually shatterproof and extremely scratch-resistant. It comes with a 2 years’ warranty. The Swiss Ronda 715Li Quartz provides long battery life of 10 years. The package consists a silicon rubber and NATO straps which are extremely comfortable. T-100 Tritium makes it super luminous even in absolute darkness. The watch provides waterproof assurance up to a 2-meter dive. Weighing less than two pounds is light-weight compared to other watches of this category. Condensation gathers once you dive deep into the water but disappears after 24 to 36 hours. Q: Are the straps capable of taking every day wear and tear? A: Yes, both the silicon and NATO straps come with a long span of life, and you can wear it everyday without worrying about scratches or the straps wearing off. Q: How long will the Gorilla glass be able to resist scratches and slips? A: The watch is made of super AMOLED gorilla glass that is used in your smartphones and other advanced electronic devices. Even if you wear it every day, the glass will look new as ever. Q: What if there is any manufacturing defect? A: The company provides a 2-year warranty on the battery and parts. In the case of any defects, you can easily claim for a replacement. The ISOBrite T100 Watch Review has been mostly positive. 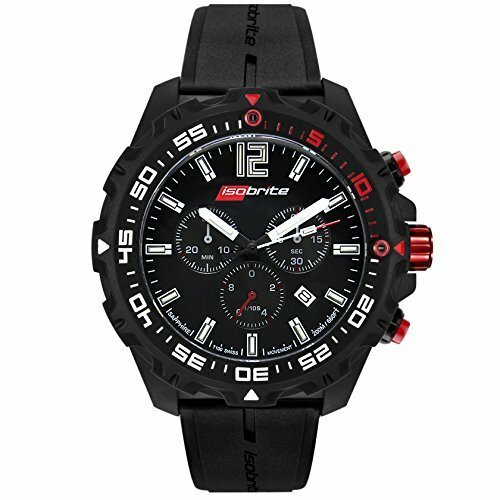 The price is on the higher side but with the features provided by ArmourLite, it is a good investment if you like watches and add them to your fashion statement or you are a professional diver. You just need to judge all the positives and negatives and take the final decision.